Modern appliances are complex machines with processors, operating systems, and application software. While there are books that will tell you how to run Linux on embedded hardware, and books on how to build a Linux application, Linux Appliance Design is the first book to demonstrate how to merge the two and create a Linux appliance. You'll see for yourself why Linux is the embedded operating system of choice for low-cost development and a fast time to market. 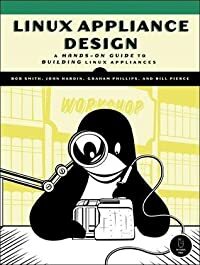 Linux Appliance Design shows how to build better appliances-appliances with more types of interfaces, more dynamic interfaces, and better debugged interfaces. You'll learn how to build backend daemons, handle asynchronous events, and connect various user interfaces (including web, framebuffers, infrared control, SNMP, and front panels) to these processes for remote configuration and control. Linux Appliance Design also introduces the Run-Time Access library, which provides a uniform mechanism for user interfaces to communicate with daemons. Learn to: Separate your user interfaces from your daemons Give user interfaces run time access to configuration, status, and statistics Add professional network management capabilities to your application Use SNMP and build a MIB Build a web-based appliance interface Build a command line interface (CLI) Build a framebuffer interface with an infrared control as input Manage logs and alarms on an appliance Companion CD includes a prototype appliance-a home alarm system-that supports the book's ons.